I have a cook’s confession to make: I don’t really like small, salty, oily fish, particularly when there are a lot of little bones to contend with. Mackerel has always made me feel slightly ill. Herring, sardines, or any other fish needing to be either canned or pickled before eating leaves me a little bit nauseous. And let’s not even talk about anchovies. I know. What kind of self-proclaimed gourmand doesn’t like anchovies? But I just can’t do it. It’s those little needle-like skeletons that so many people claim “dissolve,” but really don’t. And it is that persistent fishiness that sticks and clings, making me swear that I can smell it on my hands, clothes, and in my hair for hours afterwards. So it is very ironic that I love Caesar salad. It is just about the only dish with anchovies that I can abide by, so long as someone else does the dressing dirty work. An abundance of lovely kale in the markets has had me thinking about kale salads. Kale is the kind of leafy green that cries out for strong flavors and tastes. Because it is so fibrous, you can dress it about an hour before dinner and let the acids in the dressing soften and relax the leaves into luscious, cruciferous ribbons. Ever since reading about this Tuscan kale “Caesar” salad in the New York Times, I have been anxious to try it. Of course, some changes were made to suit my mood and what I had in the kitchen. For Pecorino, we were lucky and fortunate to have a fabulously savory and sharp wedge of Locatelli. Instead of croutons for crunch, I substituted some of Andrew Carmellini’s “Crumbs Yo!” One last Meyer lemon too. The result? A salad that was both tangy and delicate, mouthwateringly delectable and incredibly flavorful. I just want to eat it every day. 1. In a small bowl, combine the garlic, Pecorino, olive oil, lemon juice, red pepper flakes, and salt and pepper. Using a hand-held immersion blender, whizz everything together until it forms a nice emulsion, just about 15 seconds or so. Let stand for 5 minutes or more to let the flavors meld together. 2. Meanwhile, make the “Crumbs Yo!” In a small sauté pan, heat the olive oil over medium heat. Add the bread crumbs, salt, and pepper to the warmed oil, tossing gently to evenly coat all of the crumbs. Continue to toast the bread crumbs until they are golden brown, about 3 to 4 minutes. Remove the bread crumbs from the heat, and transfer them to a cool plate or bowl. Let them cool for about 4-5 minutes. 3. 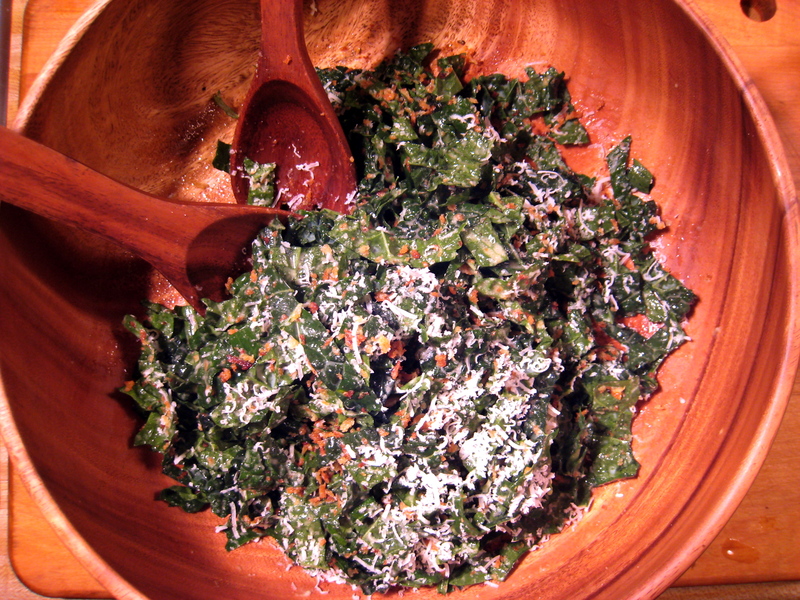 Using your hands, toss the kale with the dressing in a large salad bowl until all the leaves are evenly coated. Let sit for at least 5 minutes (but you can let it sit for longer) before adding the bread crumbs and tossing again. By adding the bread crumbs near the end, you can preserve their crunch. Shower the salad with some more freshly grated Pecorino right before serving.